A small farm may be an ongoing family venture or a new but growing business that will eventually become a full-time source of income. Even a small farm is expensive to establish and maintain. Small farm owners can use some of these expenses as tax write-offs. Save all receipts and bill-of-sale forms. For federal taxes, Schedule F is the form that a small farm operator will use to figure the farm's profit or loss. For best results, download a copy of this form well in advance of tax time. Look over the items that must be reported as income, such as the sale of produce, livestock, grains or live plants. Also, familiarize yourself with the items that may be included with expenses. Expenses include fertilizer, fuel, seeds, freight and warehousing. Knowing what expenses the schedule allows to offset income will help the farm operator stay alert to keeping these receipts. Read over Schedule F carefully. Schedule F requires the taxpayer to describe, in one or two words, his or her main crop or agricultural activity. Part I of Schedule F is the section that details income brought in by that farm. Part II provides the farmer opportunities to report expenses. The expenses offset income, and the form determines whether there has been a farm loss for the tax year. If the Schedule F shows a final loss from farming for the tax year, this loss can be used to offset other household income. Review the instructions for Schedule F to clear up any confusion regarding what may be included as an expense. Expense categories are listed on the form, but some may require annual depreciation over multiple years on Form 4562. For example, car and truck expenses, tractor and other machine depreciation may require a depreciation schedule to record the amount of depreciation treated as an expense each year. A farm owner may need to read Schedule F instructions to understand expenses that qualify as "custom hire, or machine work". In a custom hire/ machine work arrangement, a farmer hires an operator to provide both labor and the equipment used. This should not be confused with general labor hired, which may be reportable under a category called "labor hired". Plan land improvements around accepted conservation practices. 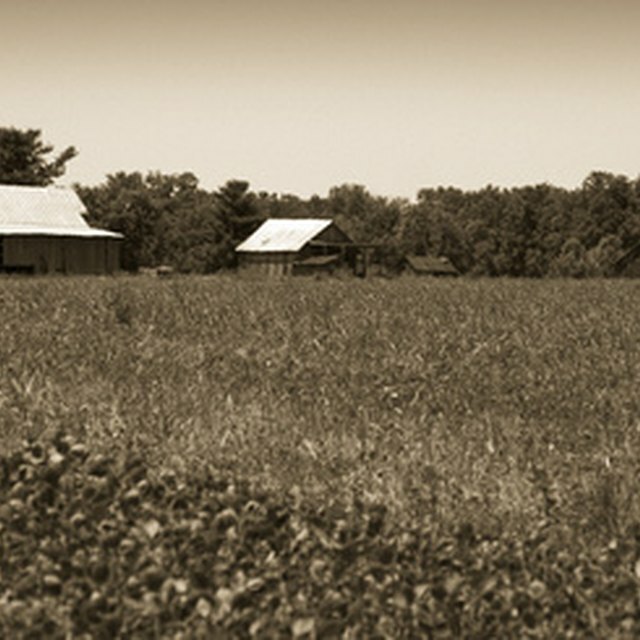 A small farm owner can write off a range of land improvements from his taxes. Changes that conserve farm land or water may be included under "conservation expenses." Earth movement projects such as terracing, grading or earthen dam-building might also be qualified expenses. Brush eradication and the planting of trees as windbreaks could qualify as well. The improvements must be consistent with a plan approved by the Natural Resources Conservation Service of the Department of Agriculture or a comparable state agency. Categorize receipts according to expenses listed on Schedule F. Most expenses on the Schedule F are self explanatory. However, many small farm owners might purchase seeds, feed and farm supplies, and non-farm supplies from the same sources. This can make keeping up with farm receipts more challenging. Always consult your tax professional for tax related advice.